Lead, a common additive in gasoline and other common materials in the early 20th century is still observed in the environment in high concentrations. Lead –a naturally occurring element, has been poisoning communities since before the Roman Empire. In fact, lead may have played a key role in Rome’s downfall. The Romans’ advance plumbing systems were built with lead-containing pipes as were their plates and pottery. Even their wine was leaded. The Romans understood the negative health impacts associated with lead exposure, but were led to believe that limited exposure would reduce their risk. The long terms effects of everyday low level exposure to lead did not occur to them. The softness and durability of lead overshadowed its health impacts as the mineral was added to many common products centuries afterwards. Despite leads limited use, it can still be found in the environment in high concentrations. The air we breathe, soil beneath our feet, the water from our faucet, the walls of our homes; may all contain lead. Lead accumulates in our bodies once we ingest or inhale the contaminant. Children have a higher exposure risk due to their normal hand-to-mouth activities. Lead can impact virtually all the body’s systems, leaving the developing systems of children more susceptible to the negative health impacts. Children under the age of 6 are the most vulnerable to lead exposure as their bodies are still developing the systems necessary to create a barrier against lead. Some of the symptoms of lead poisoning include but are not limited to learning disabilities, behavioral problems, and kidney damage. In adults, lead is typically stored in bone where it remains inert. Major physiological changes such as pregnancy or chronic disease can release lead into the bloodstream, damaging the body’s organs, the nervous system or the developing fetus. It wasn’t until the 1970s that lead began to be phased out of products in the United States. We see the aftermath of lead restriction today when we buy gasoline; unleaded gasoline. Although lead has been removed from many products, the mistakes of the past are long forgotten in older buildings, hidden under fresh coats of paint. 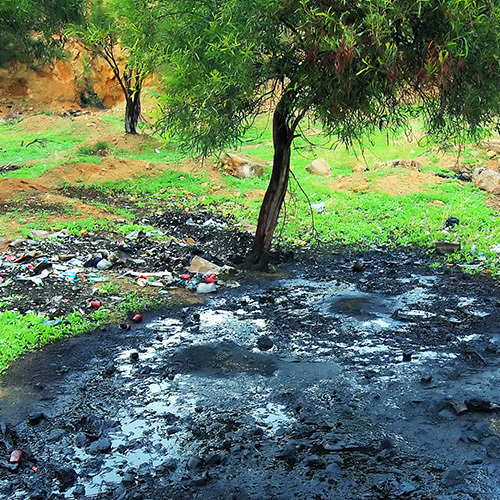 The effects of the mining and smelting lead have left a multitude of locations contaminated with hazardous soil conditions and lead-infused groundwater. Historic fill material comprised of fly ash or metal slag buried deep within the ground has the capability to infiltrate the ground water deep below. Naturally occurring concentrations of lead range anywhere between 50 ppm and 400 ppm in the environment. Lead deposited from human derived sources (paint, smelting, gasoline and occupational exposures) is typically found in the first 2 to 5 centimeters of soil where it settles first. However, urban and disturbed soils may be contaminated at much further depths. Lead concentrations detected in soil impacted by industrial uses and lead-based paint have been reported up to 11,000 ppm and higher. Lead is not rapidly absorbed by plants, nor does it biodegrade. The half-time residence of lead in soils is approximately 1,000 years. 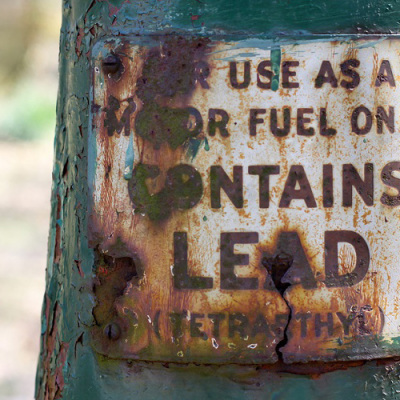 Consequently, lead is a still a concern in older communities, along interstate highways and downwind of lead smelting plants that have been shuttered since the 1960s. On December 31, 2013, the last primary lead smelting factory in the US located in Herculaneum Missouri was closed. The plant was unable to keep up with the EPA’s stringent ambient air quality standards which was reduced the ambient air quality standard from 1.5 micrograms of lead per cubic meter of air to 0.15 in October of 2008. A primary plant uses mined lead from ore while a secondary facility uses recycled lead. There are currently 16 secondary smelting facilities operating in the US at this time. Many of the primary contributors of lead pollution have been closed or removed to include smelting, mining and automobile exhausts these historic releases are threats to the public’s health today. Surprisingly, lead is still detected in high concentrations in older neighborhoods and along roads. People unknowingly track contaminated lead indoors when they walk through a lead impacted area. Removing your shoes and keeping a mat at all entryways helps reduce lead from being tracked into our homes and places of work. Occupational exposures have decreased over the years due to OSHA regulations which include good house-keeping methods designed to ensure that the lead stays at the facility. A worker exposed to lead dust could easily carry the dust home with them on their clothes if these practices were not in place. Fortunately, OSHA compliance measures and EPA regulations have dramatically reduced releases of lead into to the environment. Even though lead is naturally found in the environment, the leading cause of lead poisoning is contributed to lead-based paint found in older homes. The two most common materials that may contain lead in your home is plumbing pipes and lead-based paints. Some older wallpapers may also contain lead-based paints used in colored designs. Buildings are likely to contain these materials if they were built before 1978 prior to EPA banning lead-based paint. Even if your home has been renovated in the past, lead paint can be encapsulated under many layers of vinyl paints or wallpaper. Damage to walls could then lead to the release of lead dust or flakes, contaminating surfaces and the air. If you suspect lead in your home, the only way to confirm its presence is by hiring a licensed lead inspector in your state. The Environmental Protection Agency (EPA) also requires the removal of lead to be completed by a certified abatement firm. Removal may be regulated by the EPA If removing wallpaper or paint could disturb lead, depending on the type of facility and ages of the occupants. In older buildings that could contain asbestos containing materials (ACM), an abatement contractor could be required to be licensed in asbestos and lead removal, depending on whether the removal of one material disturbs the other. In target housing or child-occupied facilities the EPA has mandated that all work conducted by Contractors must be performed under the EPA RRP Rule. EPA’s 2008, Repair and Painting (RRP) Rule (as amended in 2010 and 2011), aims to protect the public from lead-based paint hazards associated with renovation, repair and painting activities. These activities can create hazardous lead dust when surfaces with lead paint, even from many decades ago, are disturbed. The rule requires workers to be certified and trained in the use of lead-safe work practices, and requires renovation, repair, and painting firms to be EPA-certified. These requirements became fully effective April 22, 2010. If your home contains lead pipes for plumbing, there are many steps you can take to help protect your family. The EPA recommends that you flush your system before drawing water for drinking or cooking. Flushing helps to move water that has had longer contact time with the pipes, potentially picking up higher amounts of lead in the process. Using cold water in lieu of warm or hot water for consumption also reduces the amount of lead that can leach out of pipes. If you decide to clean your walls or other painted surfaces, refrain from using abrasive brushes or chemicals that could potentially damage undercoats of paint or wallpaper and create dust. Lead remediation strategies must take into account several factors to include the source, the population at risk, the site’s physical settings and much more. Source removal, active and passive remediation techniques are heavily regulated and are designed on a case by case basis. At a local, grass roots level, urban gardeners have successfully used bioremediation to remove lead from soils. Sunflowers phytoextract or take in the lead from their roots in the soil and distribute to other parts of the plant. Therefore, once the sunflower is harvested it must be treated and disposed of as hazardous waste. On a large scale basis, it is prudent to bring in an experience professional to design a remediation strategy customized for your site. Element Environmental Solutions (E2S) has the expertise to manage lead contamination from the inside out. Our industrial hygienists and geologists have hands on experience investigating and designing abatement strategies on projects ranging from small urban dwellings to large manufacturing facilities that have not only impacted site soils but the local groundwater as well. Inside areas contaminated with lead must be contained with negative pressure to ensure the lead does not leave the contaminated area. At E2S, we work closely with our clients and contractors to develop a strategy that will work best for your project while maintaining regulatory compliance.